Happy Holidays! Now that we are moving past the halfway point of AWARE, there is a lot of activity. I would like to welcome Rana Parvez, who finally got his visa and started on Q23 with Benoit St-Onge. Piotr Tompalski and Karin van Ewijk have been appointed as research associates (Q25 and Q5). On a different note, we will be saying goodbye to Rachel Perron and Sean Lamb, who are in the final stretch of their MScs. Both have done excellent work and have set a high standard for research quality in AWARE. 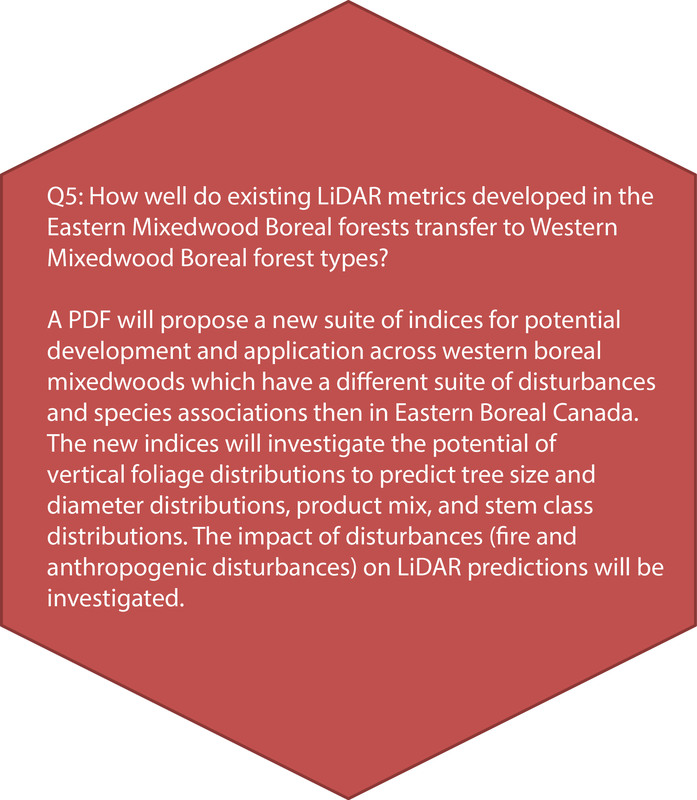 The topics covered at this year’s Silvilaser conference were on the development and application of liDAR to improve our understanding of forest ecosystem functioning. From October 10 to 12th, 2017, more than 150 participants from all over the world came together at Virginia Tech in Blacksburg, Virginia, USA, to discuss topics related to application of liDAR for forest assessment and monitoring, forest ecosystem modeling, fusion of liDAR with other geospatial products, emerging technologies like multispectral or photon counting liDAR system, amongst others. On the first day, the tone for the conference was set by Dr. Thomas Fox (Vice President of Research and Sustainability with Rayonier, Inc) who, in his keynote speech, focused on the importance of accurate and detailed information of forest stand inventory and its impact on forest management and silviculture decision support. Dr. Mathias Disney (University College London), who delivered the second keynote, described his work on TLS across a range of domains, from tropical to urban, providing new insights, opportunities and developments for estimating tree and forest structure, particularly above ground biomass, but also tree size and shape. On day two, Dr. Douglas Morton (NASA Goddard Space Flight Center) discussed research on airborne liDAR and forest inventories for intact and degraded forests across the Brazilian Amazon. In his keynote he focused on assessing changes in forest structure, composition, and dynamics following logging, fire, and drought. 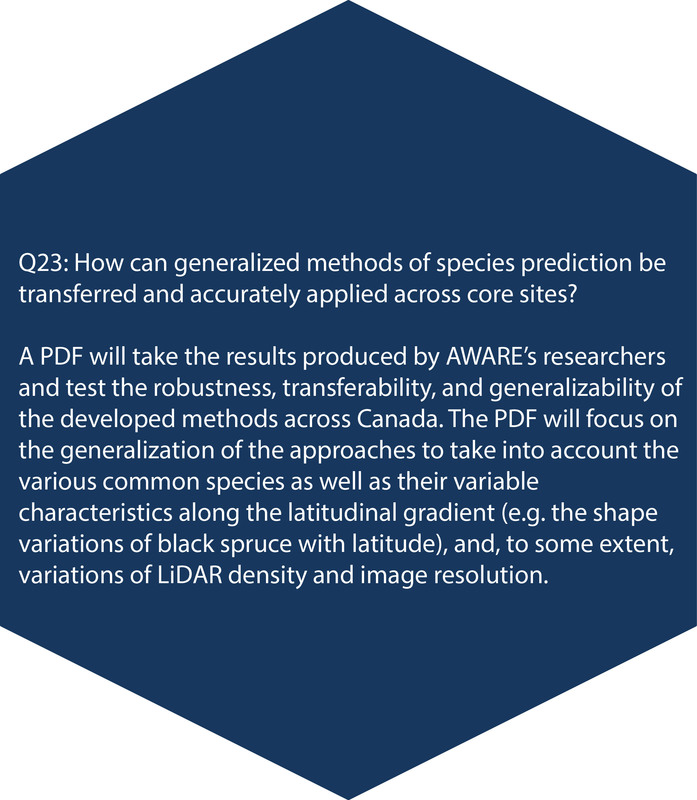 Joanne C. White (Canadian Forest Service) keynote reviewed the use of digital aerial photogrammetric technology for characterizing forest structure and its role in forest inventories. She discussed the current state of knowledge concerning large-area applications of DAP data for forest inventories and detailed the capacity of DAP to characterize forest structure for a broad range of ecosystem goods and services. Finally, Günther Bronner (Umweltdata GmbH, Wolfsgraben, Austria) shared is ideas on using open source software components to reduce data volumes of forest inventory layers while preserving inherent data variability. 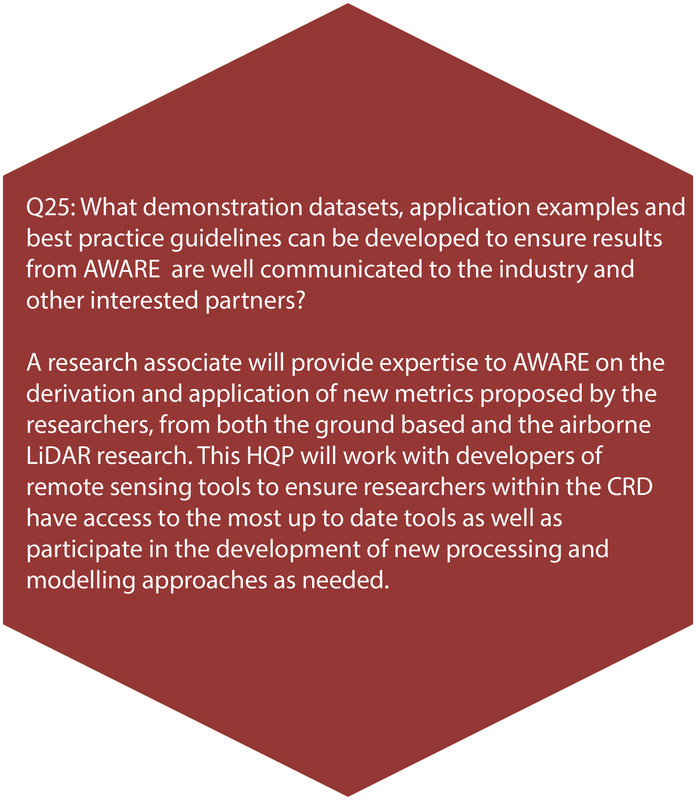 The conference was very well represented by AWARE researchers, demonstrating the importance of AWARE project within the global remote sensing community. We really appreciate the opportunity to attend this great conference and look forward for future proceedings. Rebecca Wylie is in her second year at Nipissing University where she is working towards a Master of Environmental Science (MESc) degree, under the supervision of Dr Jeff Dech. She is working on Question 14 within Theme 2 of the project. Rebecca completed her undergraduate degree (B.A.) in Biology at Carleton University in 2012. For her undergraduate honours thesis, Rebecca worked on sequencing the Inter Transcribed Spacer (ITS) genes in Chaga (Inonotus obliquus) from Canada as a way to understand relatedness to similar species in Asia. This project is what originally sparked her interest in research. After completing her undergraduate degree she moved away from research and spent four years teaching high school students about the natural environment as an outdoor education teacher. During this time she got to know the forests of Temagami, Nipigon, northern Quebec, and Labrador. After deciding to return to school she was attracted to studying the forests she had spent so much time exploring. In May of 2016 Rebecca started working in the Forest Resources Lab at Nipissing University as a research assistant, before starting her project in September of the same year. Rebecca’s project within AWARE aims at increasing our ability to predict wood quality attributes of Black Spruce in the Boreal forest of northern Ontario. 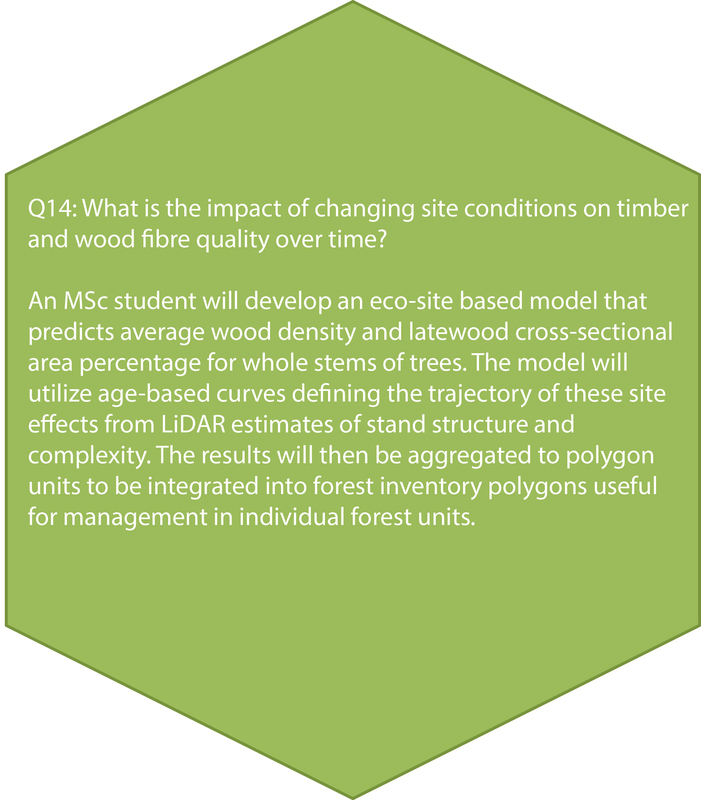 The model she is working on uses site classifications to identify stands with certain average wood or fibre properties, and through her work this model will be substantially improved by including age estimates derived from Light Detection and Ranging (LiDAR) structural variables. Rebecca loves spending time outside and takes all the opportunities she can to participate in fieldwork. When Rebecca is not in school she spends most of her time exploring the remote Canadian wilderness by canoe or snowshoes, as well as cooking, and doing art. Tristan Goodbody is a PhD candidate working under the supervision of Nicholas Coops (UBC). 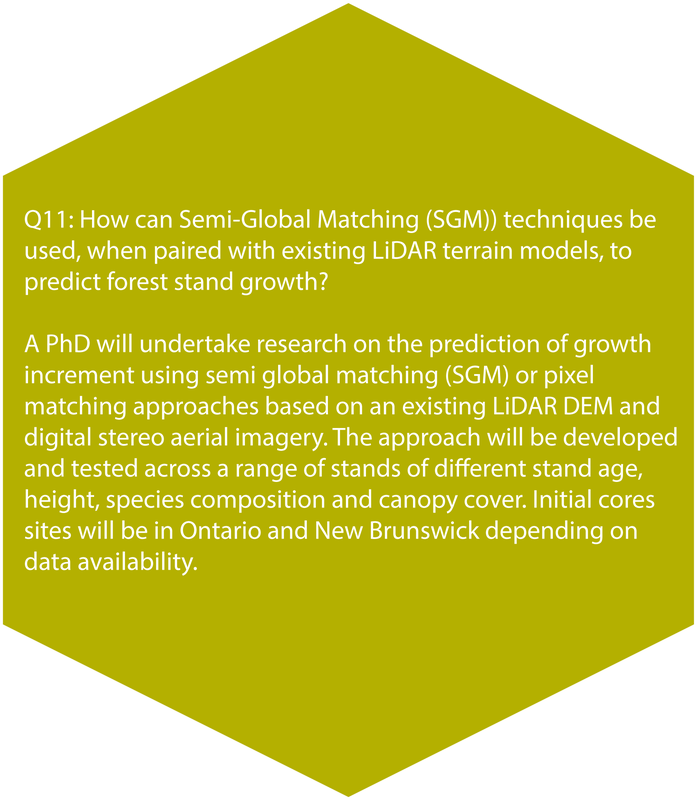 His research project (Question 11) investigates how digital aerial photogrammetry (DAP) can be used to assess landscape level spruce budworm defoliation in the Gordon Cosens Forest, south of Kapuskasing, Ontario. Outbreaks of eastern spruce budworm (Christoneura fumeriana) occur naturally in boreal forested regions of eastern Canada and the north eastern United States. Ranging in size, intensity, and duration, historical defoliation events have occurred roughly every 30-40 years, with an approximate 10-15 year duration. Stands affected by SBW defoliation present forest management issues associated with altered disturbance dynamics, reductions in stand vigour associated with height and diameter increment reductions, loss of accrued volume, as well as forest structural and compositional changes. Improvement of managerial knowledge related to the spatial, spectral, and structural distributions of spruce budworm defoliation would improve operational logistics and help to determine appropriate methodologies for managing affected land bases. In this analysis, aerial imagery acquired over the Gordon Cosens forest south of Kapuskasing Ontario, Canada, was used to produce DAP point clouds and multi-band visible and near infrared vegetation indices for the purposes of improving spatial, spectral, and structural knowledge of SBW defoliation. To do so, a structurally and spectrally guided sampling strategy was tested to determine the effectiveness of using DAP structural- and imagery spectral-metrics for delineating representative sample locations. Field measurements, focused on the collection standard forest inventory data, as well as ocular and branch level defoliation were used to determine whether SBW disturbances induced a structural signature on DAP point clouds, as well as assess the relative predictive power of structural vs. spectral metrics to model cumulative defoliation at a landscape level. Structural metrics were also used to determine their effectiveness at modelling standard forest inventory metrics such as volume and basal area using the area-based-approach (ABA). As part of AWARE’s communication strategy, Dr. Nicholas Coops and Work Learn student Agatha Czekajlo are creating a series of short videos (~3 min.) about the research conducted by graduate students for this project. For their video, each student will begin by introducing themselves, where they study, and their topic of research (~10 sec.). Then, the student will explain the research they have conducted for the AWARE project (~20 sec. ), its major results (~50 sec. ), and how it will influence the forestry industry in Canada (~40 sec.). The student will conclude the video by addressing the benefits of working in a large team like the AWARE project group (~40 sec.) and what the most interesting thing they learned from their AWARE research is (~40 sec.). These videos will be recorded individually by the student or remotely via a video chat with Nicholas and/or Agatha. We ask that videos will be recorded with a somewhat simple background (book case or wall with/without an AWARE poster or forestry-related picture), and with natural lighting from a window in the room (but not behind you). Additionally, we would like students to sit about a metre from the camera and slightly off-centered, then face the camera at about a 25° angle. Students will also be asked to submit some slides with visuals related to their research, such as graphs, maps, aerial photographs, and/or processed images. The finished product will contain the audio clip of the student’s introduction and answers along with a mixture of the slides and the video of the student. Eligible students will be contacted once they complete their research and graduate program. The AGM will be held in Montreal on Jun. 5 – 7th, 2018 at FP Innovation headquarters. FP Innovations is located in Pointe Claire, a suburb of Montreal, just a few km west of Pierre Elliot Trudeau airport. The first two days of the AGM will be open to AWARE researchers and supporters only and will feature research progress from the last year. The third day will be open to other researchers and industrial/government representatives. This day will feature research results since the start of AWARE and give attendees the opportunity to speak one-on-one with the researchers. Registration is limited and will open in January.